This picture was taken today, Monday, October 10th, which is Canadian Thanksgiving. This is a photo of Griffin, my 18 month old GSD. I am so incredibly thankful to have him in my life. Griffin has enriched my world with unconditional love, companionship, and pure joy. On rainy days, like today, Griffin and I get the entire beach to ourselves. I am so thankful for Griffin's love in my life. Happy Thanksgiving! What a beautiful photo of our Granpuppy Griifin! What a FANTASTIC photo of your boy Griffin! What a beautiful GSD male, big ears, big nose, big feet - just Gorgeous. My Mia will 2 yrs old on 11/10/11 she is a joy too and so protective. 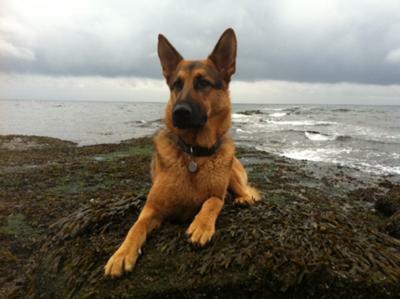 German Shepherd are "Top Dog". Take care of Griffin and he will take care of you too! We know how great Griffin is,and we too are thankful to have him in our lives! We are very lucky grandparents!! !